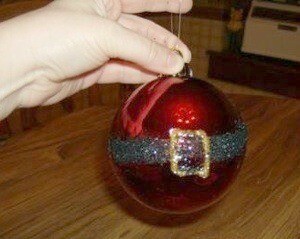 Add a glitter belt and buckle to a red ornament to create this fun Christmas tree decoration. This guide shows you how to make a cute Santa belly ornament. This cute Santa ornament is created with classic red glass balls, glue and glitter. They will add a festive touch to any Christmas tree or decoration. Very easy; take red Christmas bulb and make band around entire bulb. Roll ornament in black glitter, which I put on paper plate or you can sprinkle on. (Note is you don't want to used glitter make band using felt or velour scrap material). Let dry. Come back and use gold glitter glue and draw belt buckle. Note: If you are doing with kids, use plastic bulbs as the glass may shatter if they use too much pressure. That's really beautiful, and not like so many others I've seen. You will find me the day after Christmas at the store buying Christmas balls so that I can make your ornaments next year. Thank you.